Last time we talked to artist and curator Juan Negroni was at Milledgeville, GA for his exhibition Pie forzado.001 in which he gathered colleagues to play around the concept of active-passive. 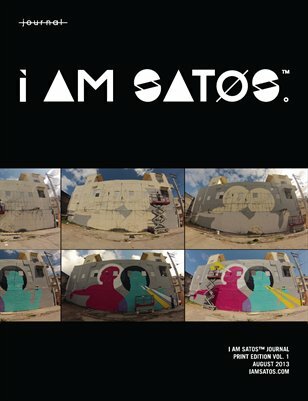 This time Negroni invites i am satos™ Journal to capture Wallpeople San Juan 2013, an event that he has been coordinating since 2011. While this is going on spectators stop, people meet, exchange ideas, collaborate. Every wall created at these events is unique and unexpected since it is the reflection not only of the assigned theme but of the interactions of people and the moment in time. This is what Negroni identifies as an artwork in itself. “Aside from getting there and presenting or creating an artwork, talking to people and meeting new people to exchange impressions and even exchange the work at the end, is an artwork itself”. For Negroni the process of coordinating the event is an artwork. The artwork, like conceptual art, consists of a process from ideation to problem-solving for solutions and execution of these, and finally the interactions of people on the medium. Wallpeople as an artwork was started in Barcelona but it is continued by the coordinators of each city, the people who collaborate with their art and even those who stop for a look. The urban wall acquires great value since it is the medium for public expression but it is also a tool for people to take on their city. Negroni is more convinced about the urban aspect of the event´s proposal because it’s out there, it’s accessible. Most important to Negroni is what people can get out of it: a sense of belonging for the event. More about our conversation with Negroni tomorrow. Tagged with Wallpeople, Puerto Rico, Art, Urban. May 29, 2013 by Mariana Ortiz-Reyes.